Foster and Partners’ award winning Bishops Square development provides a modern, public space for London, larger than the Piazza at Covent Garden. It completes the regeneration programme of this historically important neighbourhood bridging the City and the East End. Comprising 4 acres of landscaped civic space, a new covered market area on the site of the famous Spitalfields Market, 40,000 sq ft of retail space and 774,000 sq ft of high specification offices, the scheme extends the original wholesale fruit and vegetable market to create a new urban destination with an eclectic mix of offices, residential buildings, shops and a network of pedestrian routes and plazas. The development includes the restoration of the 1928 buildings along Brushfield Street, with a new covered pedestrian road to the rear. Lined on both sides with shops, it opens up new views of Hawksmoor’s Christchurch. Bishops Square itself has an outdoor performance area and water feature and a new market, Crispin Square, which is covered by a lightweight, glazed canopy to the East. Michael Snyder, Chairman of Policy and Resources Committee of the Corporation of London, commented “Bishops Square represents the completion of the majority of our regeneration plans for the former Spitalfields Market. Our partner, Hammerson, has delivered an exciting mixed-use development of which we can be proud. Indeed, it is an excellent example of the quality of building that is needed for the City of London to maintain its pre-eminent position as the world’s leading international financial centre.” During archaeological excavations at the site, a 12th century Charnel House was discovered and the challenge was then to preserve and display these important historical findings whilst still creating a hard landscaping solution which would bring out the beauty of these old remains, but also create a modern, robust and vibrant multi-use area. Marshalls worked with Townshend Landscape Architects to design and develop a robust and durable hard landscaping solution which would contrast beautifully with the historical settings recently uncovered, but also to provide a seamless and modern meeting and shopping area for the local community which was centred round the famous Spitalfields Market areas. 43 Marshalls suggested the use of natural stone paving and setts to give the development a timeless and elegant look which would include seating areas where office workers and shoppers could meet. The addition of a water lily pond in granite would bring a sense of tranquillity and peace to the development. Marshalls’ granite paving and setts in Mid Grey were specified to create a cohesive look. The characteristics of granite are synonymous with durability and beauty and Marshalls offers a wide range of granite selected from the finest sources throughout the world. Available in Polished, Flamed and Fine Picked finishes, Marshalls Granite combines rich colours with market leading performance and durability. 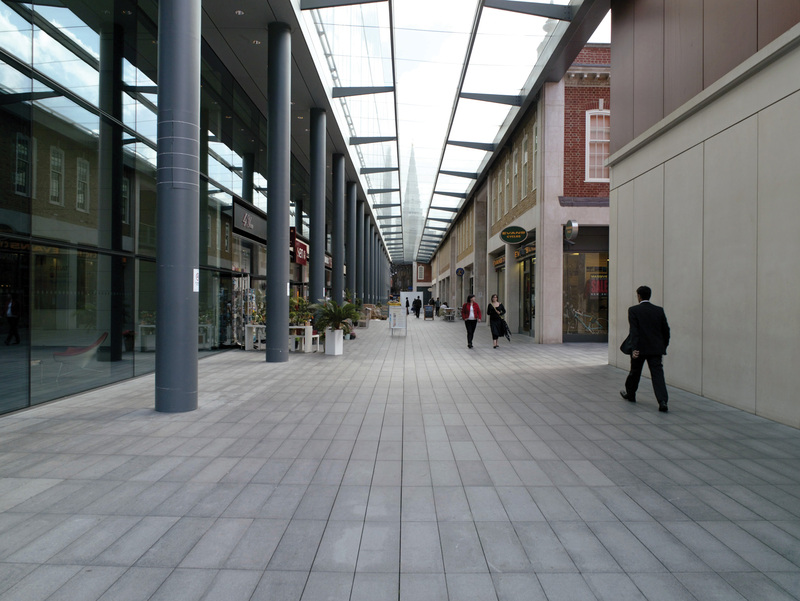 Fine picked granite paving and setts were laid over a wide area at Spitalfields and bespoke features were added in keeping with the surrounding aesthetics. 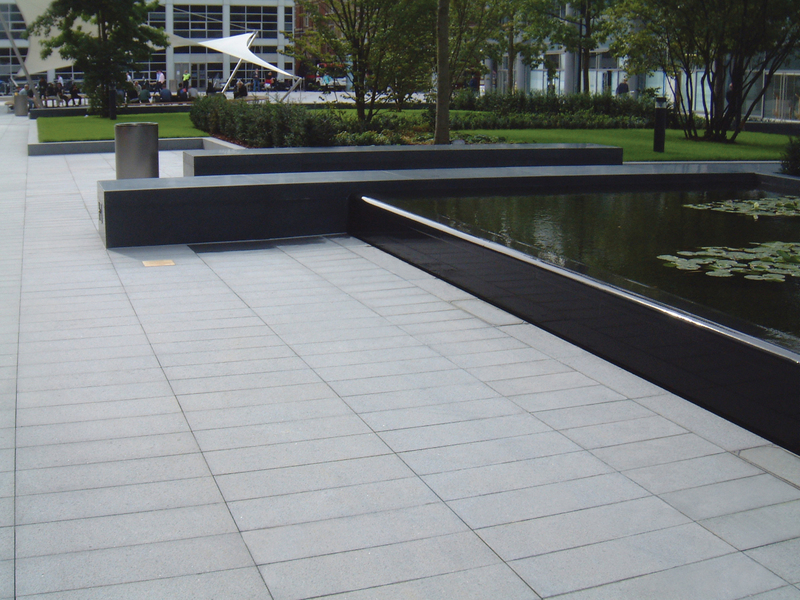 Marshalls’ range of granite paving is produced in a wide range of thicknesses, widths and lengths and is available in an extensive variety of colours which enabled the designers to incorporate unique patterns, detailing and features within the development. 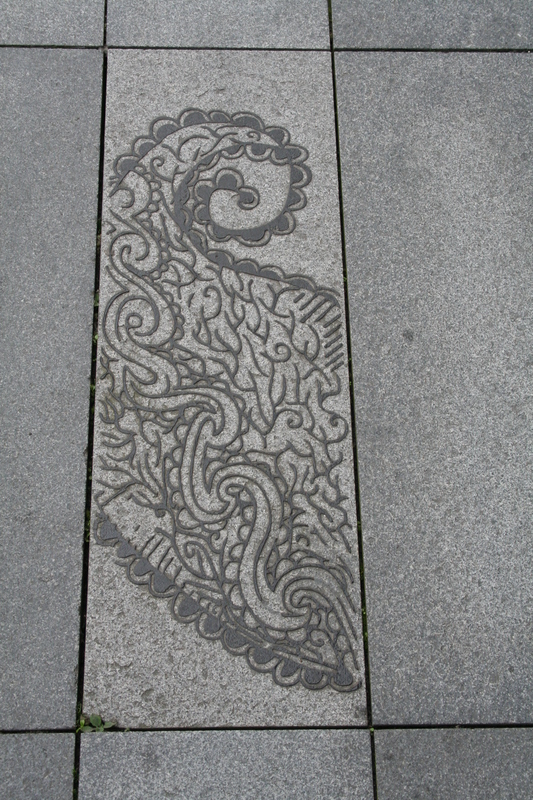 Marshalls created individual granite paving slabs which were water cut to form patterns which took their inspiration from pottery found whilst excavating the area. The sunken courtyard housing the remains of the chapel was also paved with Marshalls’ Mid Grey granite and setts which incorporated Hazard Warning Tactile Paving to warn those with disability or visual impairment that steps were present. Lighting, step treads and a granite bench were also designed and installed to provide a unique area for visitors to sit and view the archaeological remains. 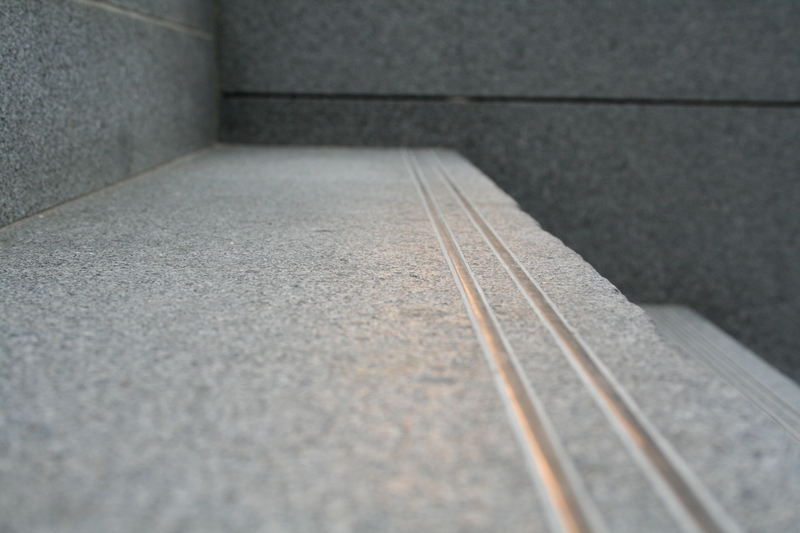 Marshalls’ technical and design teams, with their extensive technical and design experience, suggested using Mid Grey polished granite to form seating areas which also gave boundaries and form to the outside areas. The sides of the water lily pond were also formed using granite which doubled as a durable seating area.